BEST CHEFS AMERICA is the ultimate guide to chefs. Our compendium of the most talented and respected chefs in the United States is compiled using a comprehensive process of interviewing chefs across the country. Chefs are nominated for participation by fellow chefs, other culinary professionals, and food enthusiasts. To date, Best Chefs America has conducted more than 5,000 one-on-one chef interviews to gather data. The chefs we interview tell us those whom they consider to be the best. Best Chefs are those who lead and inspire their kitchens to consistently create excellent food, strive to innovate with their dishes and ingredients, and are respected by their peers. No chef can pay to be included in our guides. The only names you will find inside are chefs who are considered by their peers to be the most talented cooks today. 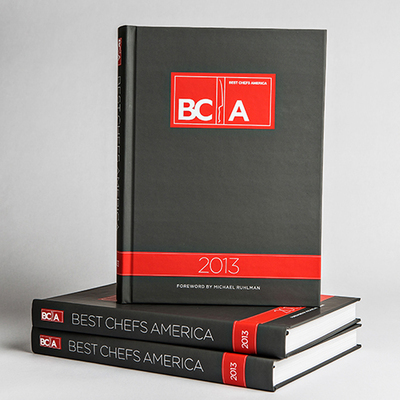 Best Chefs America is the ultimate chef's guide to chefs. This inaugural edition is the result of more than 5,000 one-on-one interviews with U.S. chefs. Inside you will find a list of the Best Chefs in America, broken down by city/state, covering more than 1100 cities, all 50 states and U.S. territories. Each listing shows the restaurant where the chef cooks along with the restaurant's address, phone number, and url. Beautiful photographs showing the emerging trends and ingredients identified throughout the course of our interviews, a section profiling 25 of the Most Influential Chefs in the U.S., and an insightful foreword by acclaimed author and cook Michael Ruhlman are also inside.